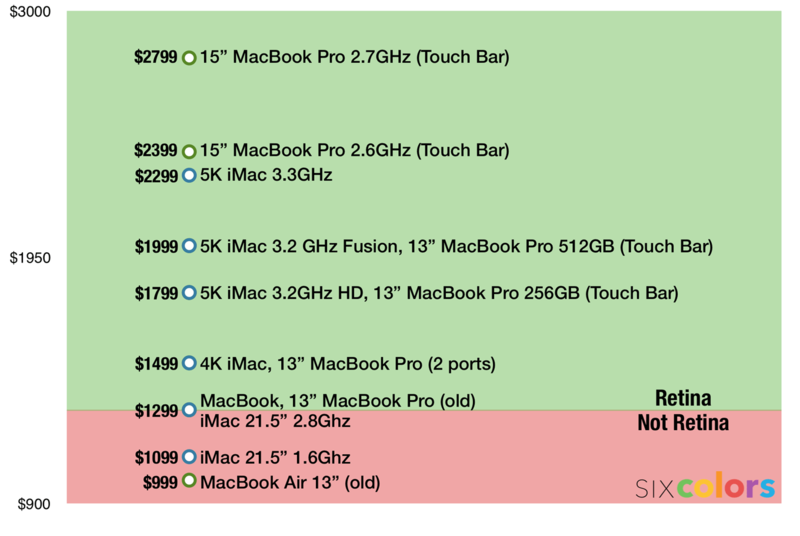 What’s struck me in all of this is the challenge Apple’s had in getting the base prices of Macs down as it converts the entire product line to Retina displays. Since the first Retina MacBook Pro arrived in 2012 for more than $2000, it’s been a question—how long would it take before Apple could clear away the non-Retina laptops and iMacs from its product line while keeping the lowest prices of its product lines intact? The chart excludes the iPad completely which I think gives a more accurate view of the lineup. You can buy a 9.7-inch iPad Pro with a high-density wide colour Retina display for just $599 and the analogous 12.9-inch model starts at $799, albeit currently lacking the P3 spectrum. Considering those prices, the Air sticks out like a sore thumb. Windows manufacturers don’t seem to have a problem selling laptops with ‘Retina’ resolution displays far below the Air’s $999 retail price. They may not be as good as the new MacBook Pro or iMac displays but they are leaps and beyonds ahead of what the Air has. I don’t expect the $999 Mac laptop to feature a wide colour gamut screen, but I do expect it to have a resolution higher than 1400×900. To take advantage of scale efficiency, I think Apple could easily package the same screens used for the current 12.9-inch iPad Pro, in a MacBook Air chassis. Bump the CPU/GPU slightly and you have a new Retina display MacBook Air. Straightforward, but way better than the current offering which is embarrassingly under-specced.